I recently had the pleasure of having an awesome 1977 Gibson Walnut SG Standard at home to play with. Well the idea was to look over the electronics and make sure it was fit to gig with for Patrycja, a friend of Verushka that I sorted the Hondo II bass for. According to The Guitar Dater Project it was made at the Kalamazoo Plant, USA on December 15th 1977, production number 103. It was great that I got a chance to play around with a Gibson Walnut SG Standard from the Seventies, that’s exactly what I was tempted to get myself, see my previous post about Gibson SG. Luckily I tried one before I bought one and I realised straight away that I still prefer Telecasters, SGs have too much neck for me. It was interesting to try a 1970’s Gibson made in USA just to compare it to all the made in Japan copies in my collection. I have to say that the feel and quality of the Japanese guitars are right up there with the American originals. Everything seems to be original, except one pot, so I thought it was unnecessary to change the original jack just because of a bit of crackle so I cleaned it instead. I cleaned all the contact surfaces with wire wool and contact spray, it seems to be enough. I tightened the pots and all the screws on machine heads, strap buttons, pickguard, pickup rings, bridge and polished up the wood a bit. 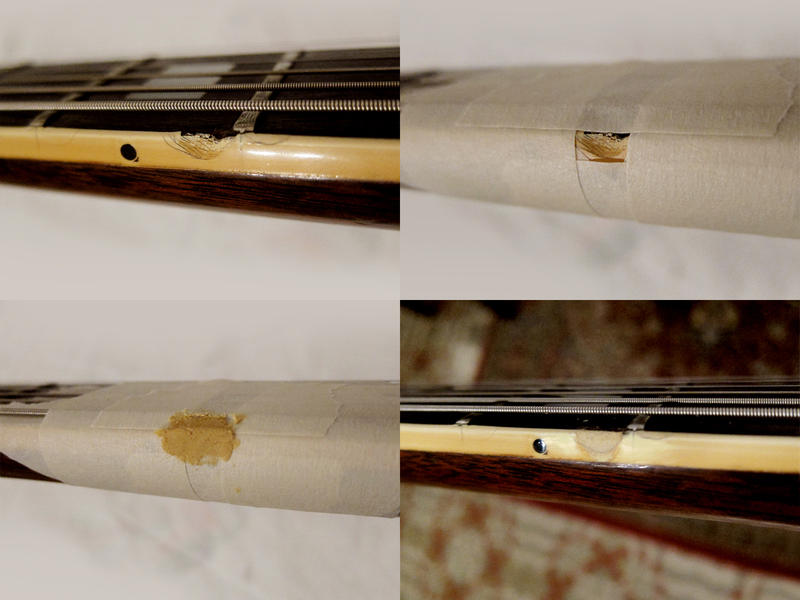 There was a fairly nasty cut in the edge binding on the 5th fret. You could feel it when you played so I masked it off and then filled it with wood filler, that happened to match in colour, then sanded it smooth and dropped a bit of nitro lacquer over it. Unfortunately I forgot to take a picture when it was all done, the last picture is before the lacquer and the final sanding with 2500 grit. 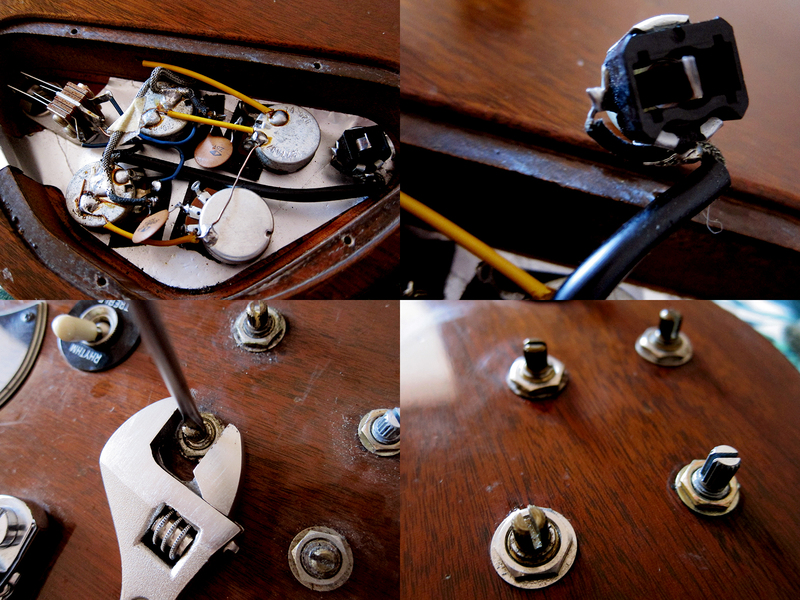 Patrycja wanted to keep the dents and scratches to the body and I agreed, it’s nice when a guitar shows it’s real age. However, nobody likes dents in the back of the neck so I did what I could to soften them a bit. I recently learned a great way of removing dents and scratches, or at least making them stand out less. Use a soldering iron and some wet paper folded up, the steam from the iron will make the wood swell and that way make the dent less deep. Sometimes this works extremely well, especially on surface scratches, and sometimes it makes no difference at all so it’s a bit hit and miss but it’s quick and easy and therefore at least worth a try. Make sure you move the soldering iron and just hold it down for a sec to not damage the surface. 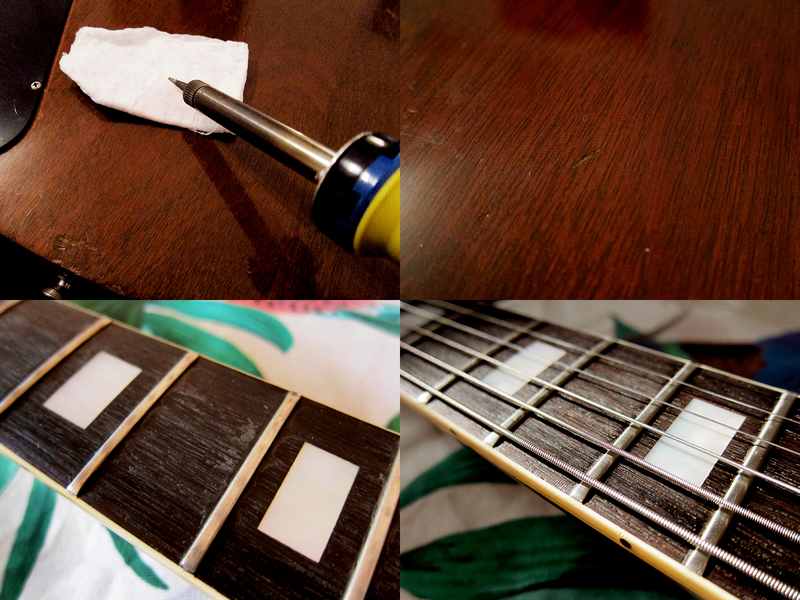 The last step was to polish the frets and fretboard, put on some lemon oil and then new strings. The action and intonation was already great so I didn’t have to adjust that.